Bank of England hiked the rate, but Pound dropped today, do you have any idea why? its all about expectation verses what actually happened. The rate increase was widely expected but the minutes suggested that future increases might be slower coming than had been expected. The lack of progress in Brexit negotiations continue to give pressure to Pounds, UK and EU will resume the Brexit talks in the coming week, the bearish trend is expected to continue. GBP/USD is ndermined by Brexit-related concerns and entered into consolidation mode below 1.1300. Strong support is lying at 1.2920 (the weekly low), which if broken to below increases the risk for downward slump and marking fresh yearly lows. 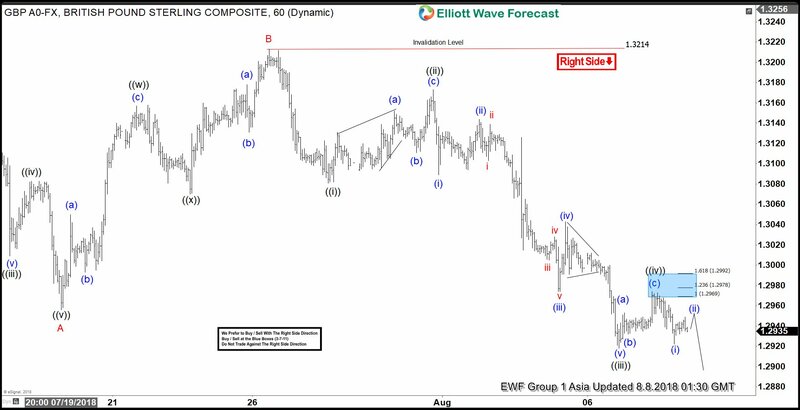 GBPUSD short-term Elliott Wave analysis suggests that the decline from 7/09/2018 peak (1.3361) is unfolding as Elliott wave zigzag when Minor wave A ended in 5 waves structure at 1.2956 low. Up from there, the bounce to 1.3214 high ended Minor wave B. The internals of that bounce unfolded as a Double three structure where Minute wave ((w)) ended at $1.3157. Minute wave ((x)) ended at 1.3070 low. And Minute wave ((y)) of B ended at 1.3214 high. Down from there, Minor wave C remains in progress in another 5 waves. The internals of wave C is unfolding as an impulse & decline to 1.3081 ended Minute wave ((i)) in 5 waves. Up from there, the bounce to 1.3173 high ended Minute wave ((ii)) in 3 waves. Afterwards, pair declined lower in another 5 waves structure with lesser degree cycles showing sub-division of 5 waves structure. And ended Minute wave ((iii)) at 1.2918 low. Above from there, Minute wave ((iv)) is proposed complete at 1.2974 high. At this stage, a break below 1.2919 low remains to be seen for final confirmation and to avoid double correction in Minute wave ((iv)). Near-term, while bounces fail below 1.2974 high and more importantly the pivot from 1.3214 high stays intact, expect pair to resume lower in Minute wave ((v)) before ending Minor wave C. The minimum extension area for Minute wave ((v)) i.e inverse 1.236%-161.8% Fibonacci extension area of Minute wave ((iv)) comes at 1.2906 – 1.2884. In case of further extension, Minute wave ((v))=((i)) target area can reach 1.2842 – 1.2810 before ending the zigzag structure & a bounce could then take place. We don’t like buying the pair as the right side tag is calling the pair lower. Brexit uncertainty continues weighing on Pound, the pair remains strong downward slopes, immediate support can be found at 1.2720. Pound / dollar attempted to rise up yesterday with peak at 1.2827, but dropped then closed down to 1.2719. The signals remain bearish for testing at 1.2650 / 00. Resistance for the day is 1.2730, whose breakthrough can take the price to a neutral zone with testing at 1.2825. I still prefer the bear camp and any bullish pressure should be seen as a normal move and a good sales opportunity. GBPUSD short-term Elliott wave view suggests that the rally to 1.3215 high ended Minor wave 2 bounce. Down from there, Minor wave 3 is taking place as impulse structure with lesser degree cycles are showing sub-division of 5 waves structure lower in it’s each leg lower i.e Minute wave ((i)), ((iii)) & ((v)). While the sub-division in Minute wave ((ii)) & ((iv)) unfolded in 3 wave corrective sequence. 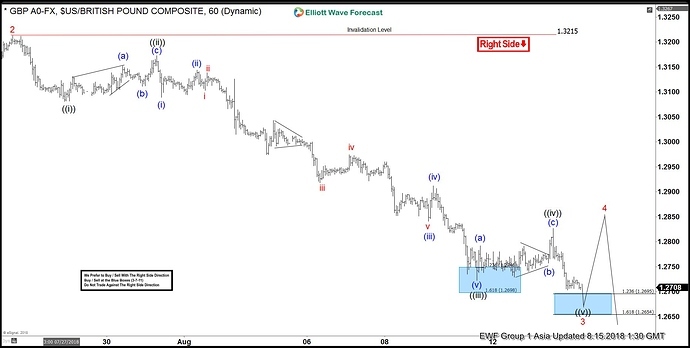 Down from 1.3215 high, the initial decline to 1.3081 low ended Minute wave ((i)) in 5 waves. Up from there, the bounce to 1.3172 high ended Minute wave ((ii)) in 3 swings as Elliott wave zigzag. Below from there, the decline to 1.2722 low unfolded in 5 waves & ended Minute wave ((iii)). Above from there, the bounce to 1.2826 high ended Minute wave ((iv)) in 3 swings as zigzag. Near-term focus remain towards 1.2695-1.2654 inverse 123.6%-161.8% of Minute wave ((iv)) to end Minute wave ((v)) of 3. Afterwards, the pair is expected to do a Minor wave 4 bounce in 3, 7 or 11 swings before further downside is seen. In case of further extension in Minute wave ((v)) of 3, pair can see 61.8%-76.4% Fibonacci extension area of Minute ((i))+((iii)) at 1.2521-1.2448 area as well before bounce in Minor wave 4 takes place. We don’t like buying it and prefer more downside against 1.3215 high in the first degree. Bullish for now. Next target: 1.2770. The government is to begin publishing its Brexit technical notices, prepare the UK consequences of crashing out of the EU without a deal on Thursday. With the high risk of ‘‘no deal’’ from Brexit negotiation, Pound continues to perform to the worst. Pound/dollar is trying to test 1.30, as it seems. Despite the correction today, I still wait for 1.3000. 1.30 would do for me. The week has ended negative for the pound. Uncertainty rules. I expect 1.29 to be tested. The cable made an attempt to test 1.30 yesterday, but better than expected NFP limited its growth. The British pound was down against the US dollar on Friday. By the close of US trading, GBP / USD was trading at 1.2916, losing 0.10%. I believe that support is now at around 1.2785, the minimum of Wednesday, and the resistance is likely at 1.3028, the high of Friday’s trading. The GBP/USD breaks above the 1.3000 level, but it has not confirmed yet such a breakout. To the upside, the 200 day EMA around the 1.3286 level could act as resistance. Below the 1.3000 level, its next support could be the 1.2800 level. Imho, the cable market is technically disposed southward. What price action is playing presently is a corrective move northward, perhaps to the mini horizontal resistance around the 1.32100 area.